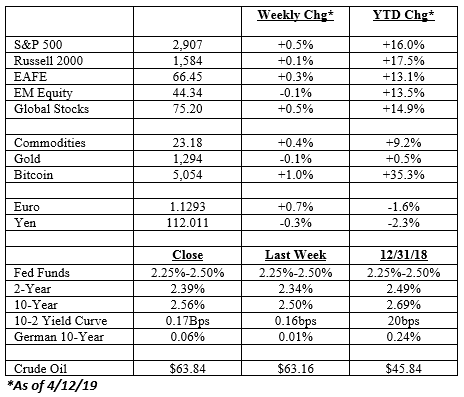 The market closed on a solid note Friday. J.P. Morgan kicked off earnings season and handily beat estimates. Wells Fargo’s earnings were in-line but revenue growth was better than expected. Overnight, Chinese credit growth grew more than originally thought, leading some to think the worst of the slowdown is over in China. Finally, Chevron’s bid for Anadarko Petroleum brought back memories of the M&A days. For the week the developed global indexes gained fractions while EM equities dipped. The Shanghai market lost -1.8% while Brazil was down -4.7%. In fixed income, bond yields pushed modestly higher with the yield on 10-year U.S. and German bonds increasing 6bps and 5bps respectively. Intermediate-term Treasury bonds lost -0.4% but high yield added +0.6%. 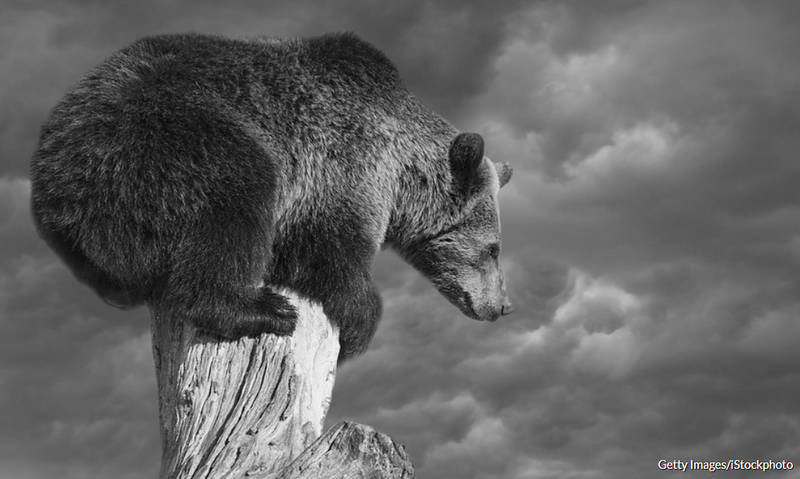 Are We Setting Up for an Economic Rebound? One of the arguments against the global recession call is the fact that China is swinging back into stimulus mode. This line of thought received a boost on Friday when we found out that China’s credit growth exceeded estimates in March. 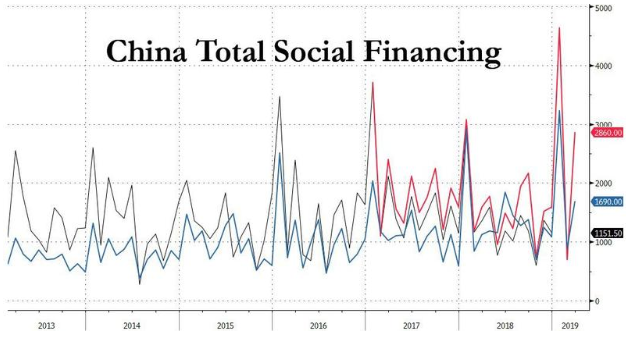 Aggregate financing was 2.86 trillion yuan ($426 billion) last month, compared with about 700 billion yuan in February, the People’s Bank of China said Friday. The median estimate was 1.85 trillion yuan in a Bloomberg survey. The other economic report that stood out was the weekly initial unemployment claims number. It fell to the lowest level since October 4th, 1969. That’s pretty impressive. 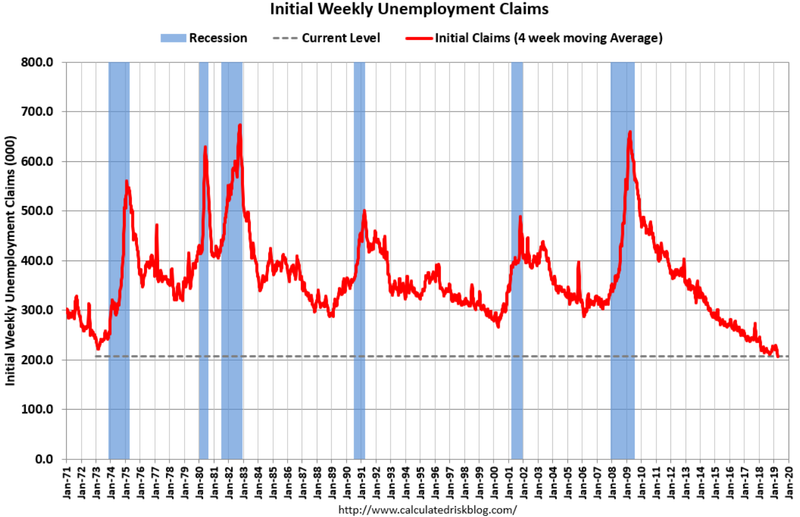 The chart below shows the 4-week moving average of claims since 1971. One thing to keep in mind is the jobless claims number is a total number, not a ratio. The size of the labor force has grown a lot since 1969. 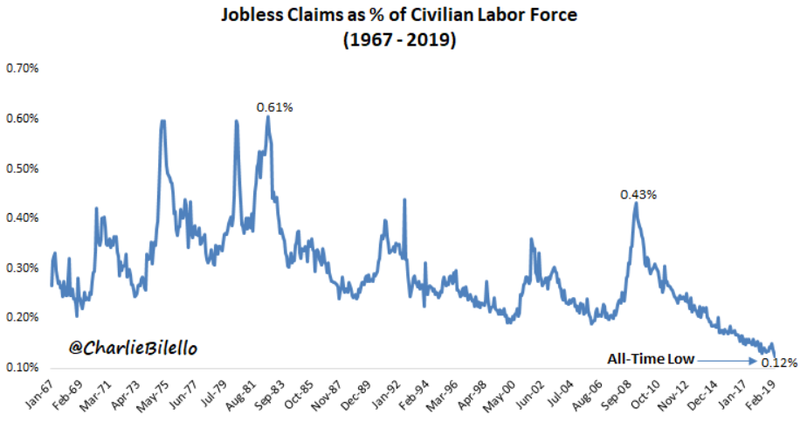 The chart below shows the ratio of jobless claims to the labor force. On this measure we are well below the 1969 level. “The downside risks that clouded the outlook for the US economy at the start of this year have abated. Our current activity indicator has picked up from 1.8% in December/January to 2.4% in March, and growth outside of the United States appears to be stabilizing. The Fed’s pivot has helped to undo much of the tightening in financial conditions in 2018Q4, and we now estimate that the growth impulse from financial conditions will improve from a roughly 1pp drag at present to a small boost by early 2020. Time will tell if they are right. But at least the chatter about the inverted yield curve has died down. Should We Worry About an Earnings Recession? And to make sure you get the point, they have this picture to go with it. You can read the article here, but basically the gist of it is that a slower global economy, the on-going trade war with China, and ‘pay-back’ for the tax stimulus means earnings might decline in the first and second quarter. They think this is a bad omen. And it could be. An earnings contraction in the first quarter would be the first decline since the second quarter of 2016. 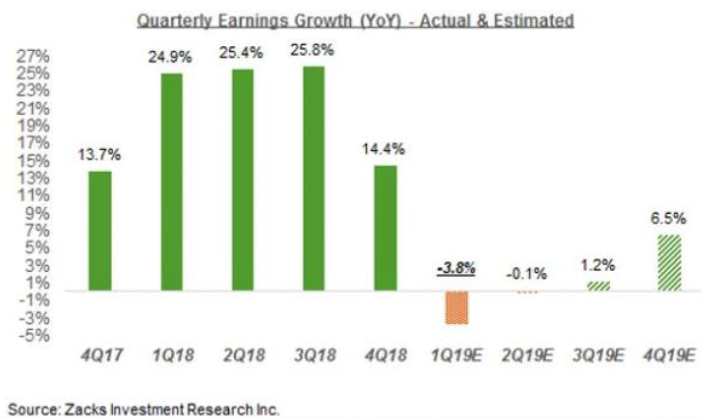 At the moment analysts think earnings could fall roughly -4% year-over-year in the first quarter while second quarter earnings are expected to fall -0.1% (the chart below is from Zacks – other firms are putting out slightly different numbers). This is a far cry from the double-digit growth rates last year. And last year’s numbers are part of the problem. We are comparing this year’s results against a pretty high bar, and those numbers were juiced by the tax cuts. Furthermore, if you look at revenue growth, the pictures is a bit different. 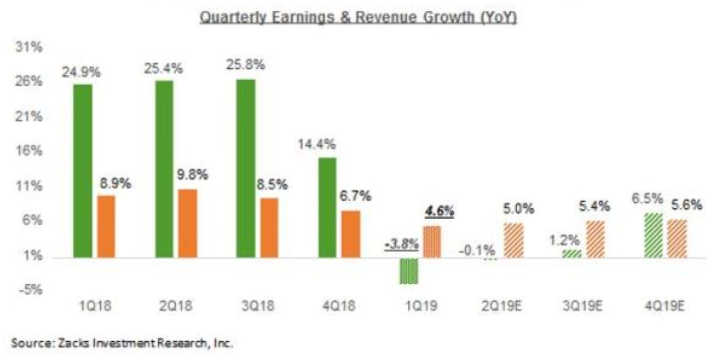 Revenues are expected to grow roughly +5% in both the first and second quarter, as you can see below. Furthermore, the biggest contributors to the earnings contraction are the energy and materials sectors that are projected to see earnings shrink -23.6% and -12.6% respectively. This makes sense, commodity prices were hit hard late last year. Oil prices fell below $45/barrel in late 2018 and spent a long time in the low $50’s in the first quarter. No wonder earnings are down. But prices are well over $60 now. Shrinking energy earnings are yesterday’s news. A broader point is that the correlation between earnings and market returns is much more tenuous than we might think. There are years when earnings go up and the market goes down. There are also years when the market goes up and earnings go down. 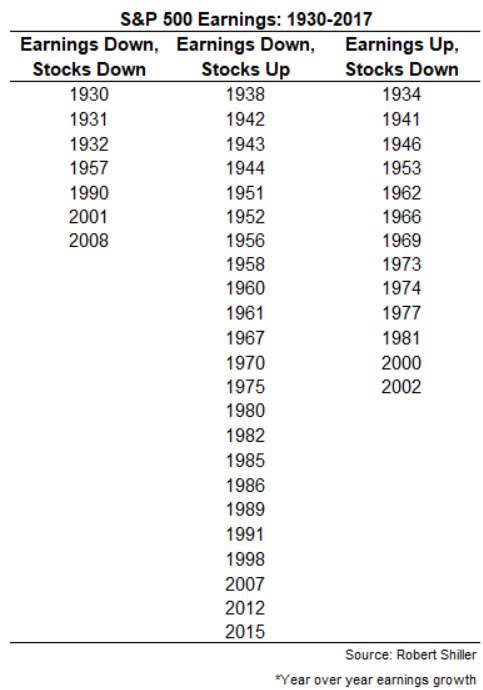 Look at the table from Robert Shiller below and try to pick a trend. 2012 and 2015 are good examples. In those years earnings contracted -0.5% and -15.4% respectively but the S&P was up +16.1% in 2012 and +1.3% in 2015. Investors are willing to look through earnings contractions if they can see a rebound soon. 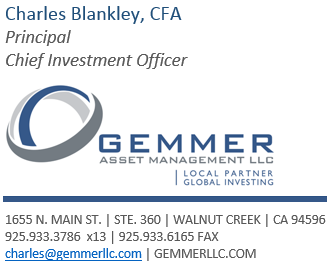 In both 2012 and 2015 investors focused on the growth that was to happen in 2013 and 2016. We suspect we are in a similar sport. Earnings growth may contract in the first half of this year, but barring a recession, we should see a rebound in the second half, especially given the bounce in oil prices. Furthermore, continued revenue growth during this period is another encouraging sign. But we will learn a lot more next week when the wave of earnings announcements hits. Steve Jobs Has A lot to Answer For! That’s the day Steve Jobs walked on stage and launched the smart phone phenomena. Since then Apple has sold somewhere around a billion phones through the end of 2017. 1.5 billion smartphones across all manufacturers were probably sold in 2017 alone. Smartphones have changed a lot of things. It’s changed how we consume the news, navigate (who fights with their spouse about directions anymore?? ), date, and pretty much most aspects of life. It has certainly changed golf. 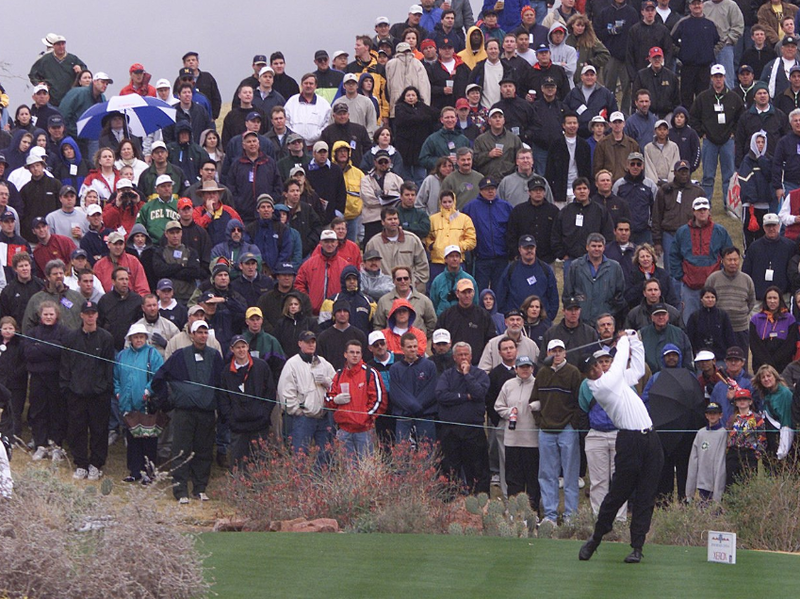 Take at look at Tiger at the Master in 2002. 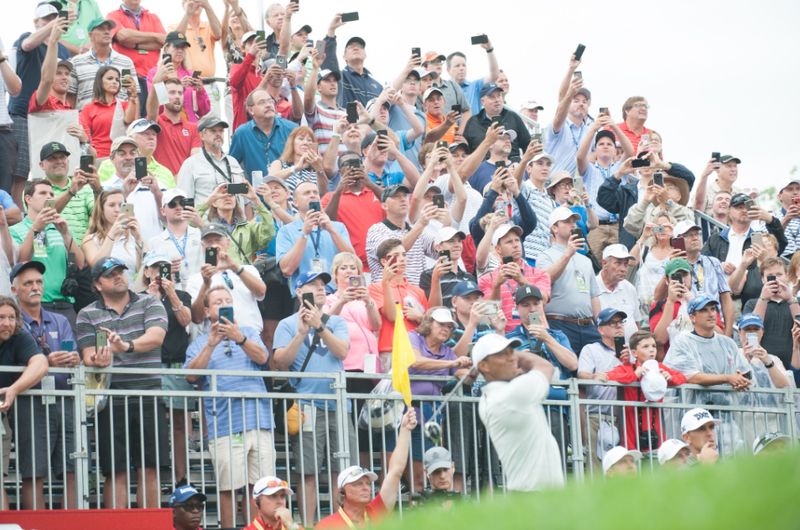 Bunch of (mostly guys) standing around watching Tiger swing. Now look at the same picture in 2018. Now we are watching Tiger through a screen, even if we are standing right next to him. I’m not sure Steve Jobs did us any favors! !